This information was produced by the staff of the Belin-Blank International Center for Gifted Education and Talent Development (B-BC) at the University of Iowa (belinblank.org). The resources and information listed here are for informational purposes; there is no direct or implied endorsement by the B-BC. Services provided by the B-BC include programs for academically talented K-12 and college students, professional development for teachers, the Assessment and Counseling Clinic, the Acceleration Institute (accelerationinstitute.org), and graduate programs and research in gifted education. Our pages are formatted to be printer-friendly. Simply click and print. 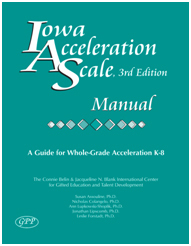 The Iowa Acceleration Scale, 3rd Edition is a tool to help schools make effective decisions regarding a grade-skip. The IAS guides a child study team (including educators, teachers, parents, and other professionals) through a discussion of the academic and social characteristics of the student. A standard of comparison with students who have had successful accelerations. The IAS, 3rd Ed. can be purchased from Great Potential Press. 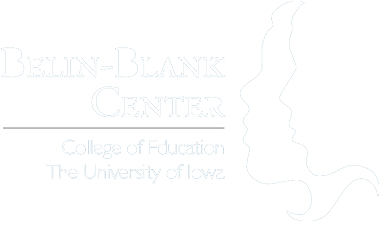 The proceeds from the purchase of the IAS are fully returned to Belin-Blank Center student and teacher programs. No authors of the IAS benefit financially from sales of the book. Some students would benefit from subject acceleration. For more information, visit our Subject Acceleration page.